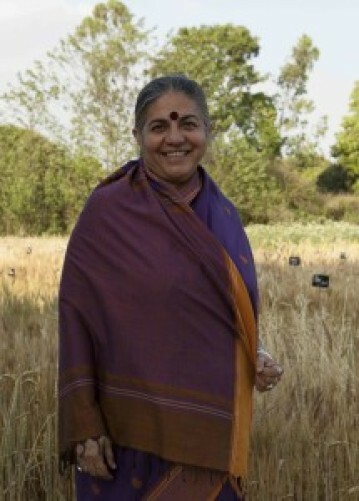 Dr Vandana Shiva is a feminist and ecologist activist. She founded Navdanya - an Indian alterglobalist NGO - in 1991 and received the alternative Nobel prize in 1993. Navdanya farm is a model community seed bank, advocating to bring seeds back into the common good. Why did you create a seed bank? Because small-scale farmers must remember that they were the first breeders and even the only seed producers until about 20 years ago. Since then, corporations that produce GM seeds and pesticides have been doing everything to criminalize seed saving and make farmers dependent. Farmers, with the help of Navdanya, must practice “Seed Satyagraha”, the fight for truth, in Gandhi’s footsteps. Why do those farmers need to produce their own seeds? The first reason for farmers to produce their own seeds is to make use of it. That is why community seed banks are important… We have helped set up 120 seed banks and have saved more than 4000 rice varieties, 150 wheat varieties, and hundreds of varieties of pulses, oilseeds and vegetables. This fundamental fight for freedom through participatory breeding also led us to help fight the European seed law in 2014… and convinced us to support US groups that are being criminalized for saving seed. Can you tell us about your fight against GMO seeds? The push for GMOs as a miracle is smoke and mirrors. To begin with, GMOs are the symbol of the ideology that corporate profits come before the life of people and biodiversity, robing citizens of their freedoms as farmers and eaters. And we can easily see that after 20 years of commercialisation, hunger and malnutrition are still widespread. The case of Monsanto’s “Bt cotton” is symptomatic, isn’t it? Absolutely. Despite the Indian law which doesn’t allow patents on seeds, Monsanto controls 95% of seeds with its GMO cotton. The corporation collected 900 million dollars from small farmers in India, pushing them into crushing debt. Before destroying alternatives to bt cotton, including a local hybrid seed supplier, local seeds cost 5 to 9 INR per Kg… In 2006, the price had increased to 1600 INR for 450g, including a 1250 INR trait value charge collected by Monsanto! And for a debatable improvement? That is the least you can say. In 2010, after 8 years of commercialisation, Monsanto has admitted in its own website that the bt cotton Bollgard II was now inefficient against pink bollworm, leading to a suicide epidemic among the nearly 5 million farmers who were planting the product in India. 300,000 Indian people committed suicide between 1995 and 2013, especially in Maharashtra, where 53,818 farmers have taken their lives off. That explains your fight for the right for farmers to produce their seeds? Yes. Before globalisation, 80% of indian seeds were farmers's own varieties, bred by them. And all our efforts are made to have it back. Because we don’t need Intellectual Property Rights - that only benefit the industry - to achieve a world without hunger.